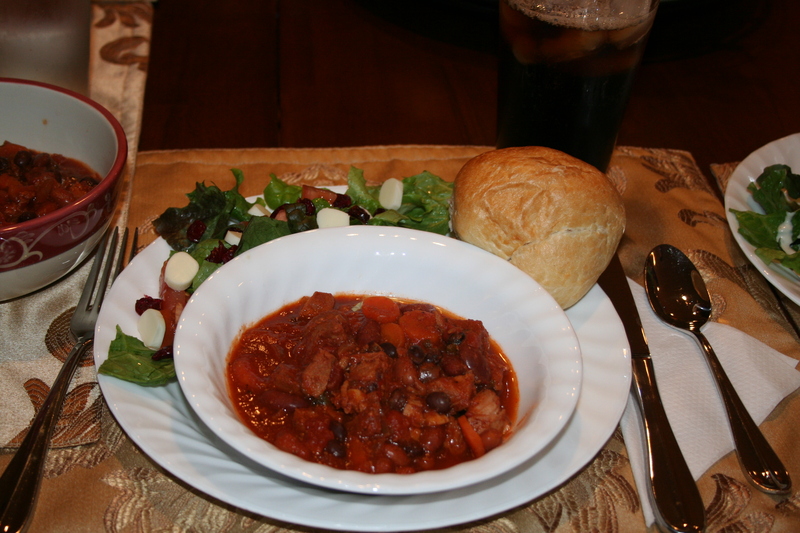 We tried this recipe during week two of my Crock Pot Revolution – Slow Cooked Meals on Trial – Part 2 blog. My family, and friends, loved this recipe. It makes a lot (enough for 10). It is VERY flavorful and delicious! It is one of our favorites. I’ve had quite a few people request the recipe so I thought I’d post it here, on my blog. Enjoy! Chunks of pork tenderloin make this chili especially robust. Spicy peppers add even more flavor. Combine onion, garlic, carrots, chili powder, oregano, jalapeno, salt and pepper in a 5-quart (or larger) slow cooker; stir. Add remaining ingredients; stir again. Cover and cook on HIGH setting for 6 to 8 hours. Yields about 1 cup per serving. We start cooking the chili at a HIGH setting so the ingredients quickly reach a safe temperature. You can reduce the heat to low after 3 to 4 hours, if you prefer. * This is a Weight Watchers Recipe.